If you love art and history, you don't want to miss walking Asheville's Urban Trail, a 1.7 mile walking tour through the streets of downtown Asheville. Asheville's history and past are told through 30 stops, each with public sculpture which function as landmarks along the Urban Trail. Read more about Asheville's Architecture. 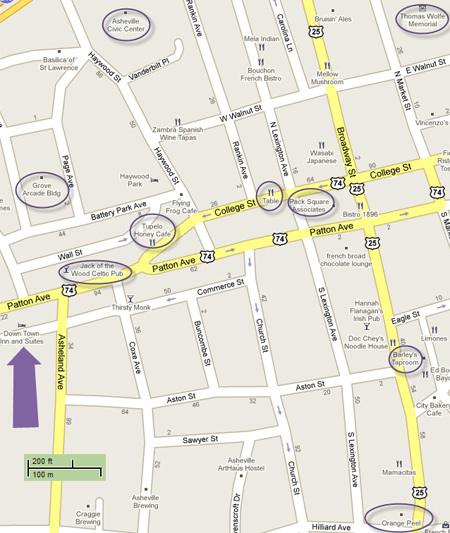 Urban Trail maps are available at Pack Place, many downtown stores, and other information centers in town. If you want to learn how Wall Street got its name or which of Asheville's founding fathers had an incurable case of the hiccups go on an Urban Trail guided tour. Guides consist of local historians volunteering their wealth of knowledge about the city and are available by reservation. Please call 828.258.0710 x108 two weeks in advance of your desired tour date to coordinate a tour. Located in central Asheville, the W.C. Reid Center is the home to a variety of creative cultural art programs for all ages focusing on visual, performing and computer arts. The center features classrooms, a gymnasium and an auditorium with a stage.